We have had a very busy week! I wish every week could be like this one. I started seeking out some QT with other moms/babies/kids and it just so happened that everything was scheduled for the same week. Tuesday we went to a neighbor's house where we had three mommies and four kids ranging in age from 9 months to 2 years. Lila has been around Carson quite a lot and Carson is an incredibly mobile 6 month old. But, Carson doesn't have those toddler tendencies yet. She still smiles and laughs constantly and only notices for like two seconds if her toy is taken away. That being said, Lila is never around toddlers that are older than her. She pretty much just sat and stared at the two older boys like they were aliens as they argued over toys instead of just grabbing. It was almost like her face was saying, "why do they need to talk about it. Why don't they just grab what they want and go on their merry way? I mean, what the heck does "my car" mean anyway?". Little does she know that being a female relegates her to being part of the "talks about everything" club later in life. Wednesday Carson came over for a few hours and then we went to their house for dinner. Lila and Carson do a lot of parallel playing and the only real interaction happens when one needs to get around the other. Carson will pull up on Lila and Lila will try and move Carson's hand. They are both adorably amusing little girls so putting them together makes for a good laugh. Today, two girls I taught with came over. One has a seven month old and the other has a newborn. Lila treated Sofia, the seven month old, the same way she treats Carson....a little toy grabbing and staring but nothing major. She was somewhat enamored with Wyatt, the newborn, and tried very hard to wake him up while he was sleeping in his carrier (sorry Heather). She wanted to grab his feet and be her clumsy self around him and it was kind of hard for her to understand that that wasn't an option! So, now that you know how Lila handled our playdates, here's how I did. I LOVED THEM. I love being a stay at home mom. I mean, I really, really love it. BUT, I love speaking real words in a real conversation too. I also love conversations that don't include "no honey, the little boat with Ernie in it is not a telephone" or "please don't eat the dog food!". I am so excited you have had such a great week and that you are meeting new friends with kids! You are such a great mom! 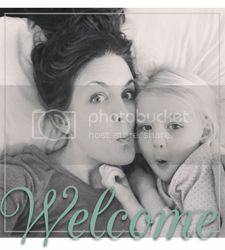 Oh and I'm so excited you are a stay at home mom b/c you update your blog more often! I'm with Meg - I enjoy Stay at Home Jana because she posts more frequently!!! I'm so glad you're having such a good time!